And there’s a high school, of course – though not the one that was seen in TV's Beverly Hills 90210 (that’s Torrance High School, to the south of the city). 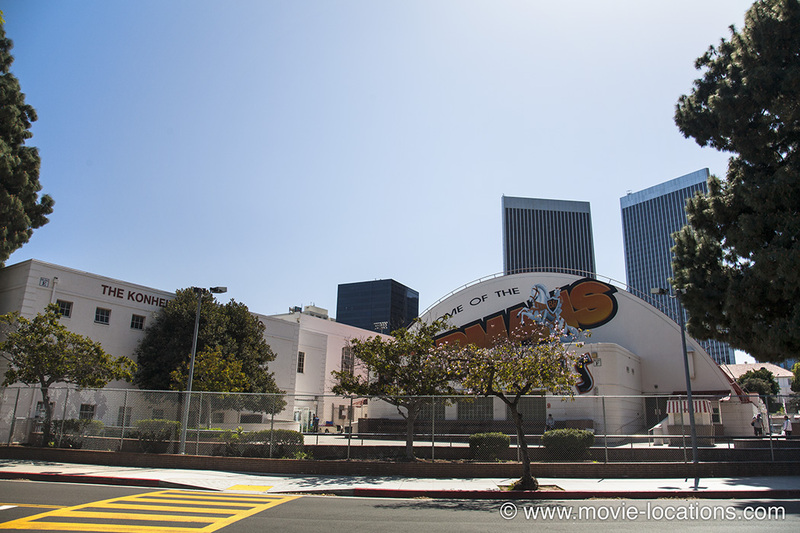 The real Beverly Hills High School, 255 South Lasky Drive at Moreno Drive, houses the Swim-Gym, the gymnasium with a floor that unexpectedly rolls back to reveal a swimming pool, which is one of the very few real locations used in Frank Capra’s 1946 Christmastime family favourite It’s A Wonderful Life. Lasky Drive, by the way, is named after producer Jesse L Lasky, one of Hollywood’s pioneers, who formed a production company with Cecil B DeMille and Samuel Goldwyn (then still known as Samuel Goldfish) in 1913 and headed Paramount’s early years. 9101 Wilshire Boulevard, was Kate Mantilini restaurant which became the ‘coffee shop’ in which Neil McCauley (Robert de Niro) and cop Vincent Hanna (Al Pacino) briefly face off (the legendary first appearance of de Niro and Pacino on screen together) in Michael Mann’s Heat. The restaurant closed a couple of years ago but the premises appears still to be vacant. Kate Mantilini, if you were wondering, was a 1940s boxing promoter. North of Santa Monica Boulevard is where the strictly right-angled street grid starts to wave about woozily, as if the town planners were beginning to enjoy a little whiff of relaxation, before totally cutting loose in the tangle of Beverly Glen and the Canyons. This is Bungalowland: eerily quiet, tree-lined avenues where you’re unlikely to see a living soul. It’s all very luxurious, but life is confined to the interiors and the backyards. There’s no sense of a community – no local newsagent, corner grocery or friendly bar. I really would not like to live here. "Sitting here in Blue Jay Way..."
‘Armed response’ signs – hardly the warmest of welcomes – sprout from lawns, which seem always to have been clipped within the last fifteen minutes. Walk more than ten paces from your car and you’ll be regarded with grave suspicion. You’ll also shatter the silence with a block-wide chorus of barking guard dogs. The ever-vigilant police are proud of their one minute response time. Don’t be fazed. Charm and naivety are your best tactic. There are few big movie stars here any more. Don’t count on a quick chat over the fence with Tom Cruise as he washes the car. The major players have retreated to gated estates in Malibu or to the Hollywood Hills, behind unfeasibly high walls, security gates and batteries of CCTV cameras. Celeb spotting in Beverly Hills is largely restricted to ogling the former homes of long-departed stars of a more innocent, pre-stalking era. 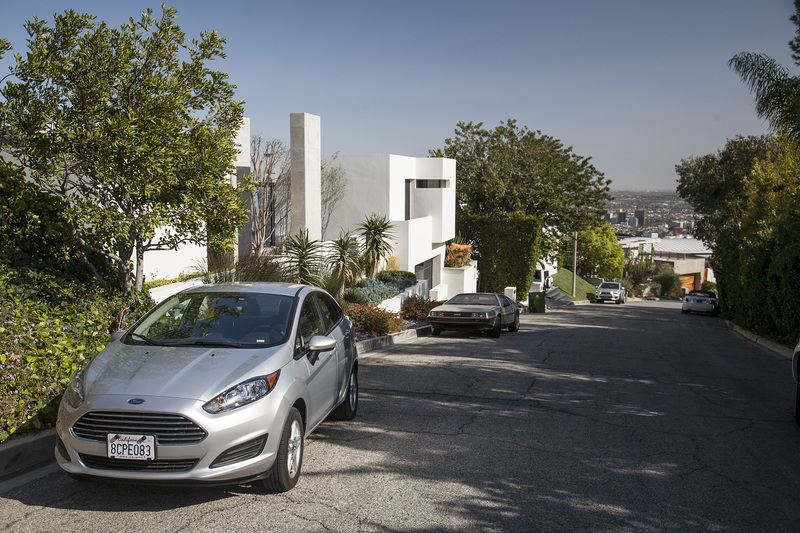 Roxbury Drive, running north-south from Canon Drive to Santa Monica Boulevard, has proved a particular favourite. Former residents include Angelina Jolie (801); Lionel Barrymore (802); James Stewart (918); Lucille Ball (1000); Jack Benny (1002); Peter Falk (1004); Madonna (1015); composers George and Ira Gershwin (1019 and 1021); and Agnes Moorehead (1023). Up in the Hills themselves is The Bird Streets area – the very fancy area above the Sunset Strip where the streets have names such as Oriole, Thrasher and Nightingale, home to plenty of celebs and to Blue Jay Way. Beatles fans may recognise the name from George Harrison's song Blue Jay Way on the 1967 Magical Mystery Tour EP: "There's a fog upon L.A. / And my friends have lost their way… / Soon will be the break of day / Sitting here in Blue Jay Way"